Confession time: I didn’t actually read all of my assigned seminary textbooks. (Gasp.) It’s sad, but it’s true of this lazy academian. Academan. Student. 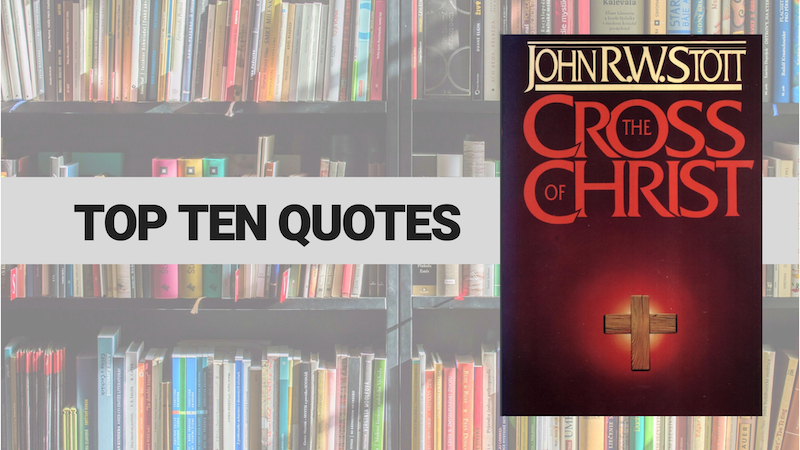 One of those books that was assigned-but-went-unread was The Cross of Christ by the late John R.W. Stott. Part of my reading avoidance rationale was the font is so tiny! and there’s just so many words! Well, nerd friends, you’ll be glad to know that I finally put on my big boy britches and worked through Stott’s masterwork earlier this year. The font is still tiny (maybe tinier than it was years ago?) and I found myself having to read and savor slowly (no more than five pages in a sitting). But this is a rare work that causes you to worship as you read, and I commend it to you. Before we can begin to see the cross as something done for us (leading us to faith and worship), we have to see it as something done by us (leading us to repentance). …the rulers sneered at him, shouting: “He saved others, but he can’t save himself!” Their words, spoken as an insult, were the literal truth. He could not save himself and others simultaneously. He chose to sacrifice himself in order to save the world. To recover the concepts of human sin, responsibility, guilt and restitution, without simultaneously recovering confidence in the divine work of the atonement, is tragically lopsided. It is diagnosis without prescription, the futility of self-salvation in place of the salvation of God, and the rousing of hope only to dash it to the ground again. The life of the redeemed is a feast. The possibility of substitution rests on the identity of the substitute. …God’s anger is poles apart from ours. What provokes our anger (injured vanity) never provokes his; what provokes his anger (evil) seldom provokes ours. The constraint of Christ’s love, Paul says, rests upon a conviction. It is because we are convinced of the purpose and costliness of the cross, namely that we owe our life to his death, that we feel his love tightening its grip upon us and leaving us no alternative but to live for him. …nothing weans us from worldliness more than the cross of Christ. True self-denial (the denial of our false, fallen self) is not the road to self-destruction but the road to self-discovery. He entered our world of flesh and blood, tears and death. He suffered for us. Our sufferings become more manageable in the light of his. See all posts in the Top Ten Quotes series. Disclaimer: FTC watchdogs will probably want you to know that the authors represented did not ask for this endorsement, nor did they provide me with free swag in order to do so (unless specifically mentioned otherwise on the particular page). I’m just a really satisfied customer who wants to let you know where you can get some great products. So there. Further, if you order a resource from a link on any “Top Ten Quotes” page, I may receive a small affiliate commission from Amazon. If that bugs you, feel free to bypass my link and buy from a vendor of your choice. But still: buy it. I only promote books that have benefitted me and that I believe will benefit you.